Domingo Acevedo was lighting up the radar gun at 99 mph on Wednesday night, and in the Staten Island dugout, Butch Henry could only watch and smile. "He's got overpowering stuff," Henry said. "I mean, the sky's the limit." The Yankees' No. 29 prospect flashed some of that velocity while allowing two hits and tying a career high with six innings as Class A Short Season Staten Island blanked Tri-City, 3-0, at Richmond County Bank Ballpark. Acevedo (3-0) struck out eight and walked two, throwing 59 of his 91 pitches for strikes before Jonny Drozd struck out three over the final three innings for his second save. "Every time you see him, he's getting more comfortable," said Henry, who spent seven years in the Majors. "I believe he topped out at 99, pitched at 96, and that was his average. He's beginning to get a feel for his delivery, just repeating it and making quality pitches throughout the count, not just first pitches. He's able to throw strikes behind in the count and command the zone with three pitches. Hitters aren't able to sit on one pitch." Acevedo, who throws a fastball, a changeup and a slider, induced seven ground balls and didn't allow a single ball in the air Tuesday. Henry said he routinely sees the towering 6-foot-7 right-hander topping out near 99, but his ascent through New York's system will depend more on his ability to consistently throw strikes, not just his raw velocity. "If you look at his fastball, he's up in at the range every outing," Henry said. "His progress is going to be based on how fast he progresses and the things he learns. He's not been pitching his entire life, so it's a case where he's learning as he goes and he's picking things up fast. He projects very high right now." The Yankees discovered Acevedo in the Dominican Republic and signed the righty in March 2013 at age 18. At 6-foot-7 and 190 pounds, he's the same height as big leaguer CC Sabathia but weighs 100 pounds less). 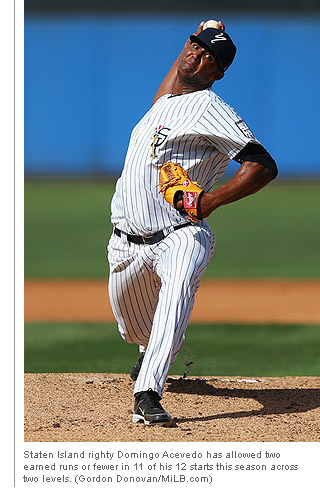 According to MLB.com, he's been clocked as high as 100 mph. He spent his first summer in the Dominican Summer League before appearing in just five games last year with the Gulf Coast Yankees, another Rookie-level club. He began 2015 with Class A Charleston, where he made one start on April 18, before landing on the disabled list until the opening of short season in June. Since joining Staten Island, Acevedo is 3-0 with a 1.69 ERA in 11 starts. His last five outings have been especially good -- he struck out a career-best 10 batters on Aug. 22 at Lowell and has allowed one earned run or fewer in all of those starts. Henry said the Yankees are focused on developing Acevedo's mechanics and delivery consistent for now. "We work on basically repeating -- doing the same things with every pitch, maintaining his balance and just keeping things in line," he said. "He's got a powerful arm and sometimes he wants to throw harder than he should, so we work on maintaining a solid, repeatable delivery above all else." Acevedo exited before hitting 100 pitches Wednesday, in line with the Yankees' plan to keep the youngster healthy entering 2016. "We've got him on a fairly strict count, and when he starts to get up there, he's going to come out. He could have been throwing a no-hitter and he would have come out. We're not worried about the results, we're worried about making sure he stays healthy and he works hard. Any time you're a big guy and throw that hard -- he has to work hard and so we keep a close eye on him. He didn't labor tonight, it was a lot of easy innings." Henry also thinks Acevedo is ready to return to Charleston, a likely destination next spring. "That's not for me to decide, but I'm really enjoying my time that I have him here," he said. "When the powers that make those decision decide it's time to move him up, I think he's capable of doing so at any point. He's showing he's starting to separate himself from the level of competition here. He's pitching very well."